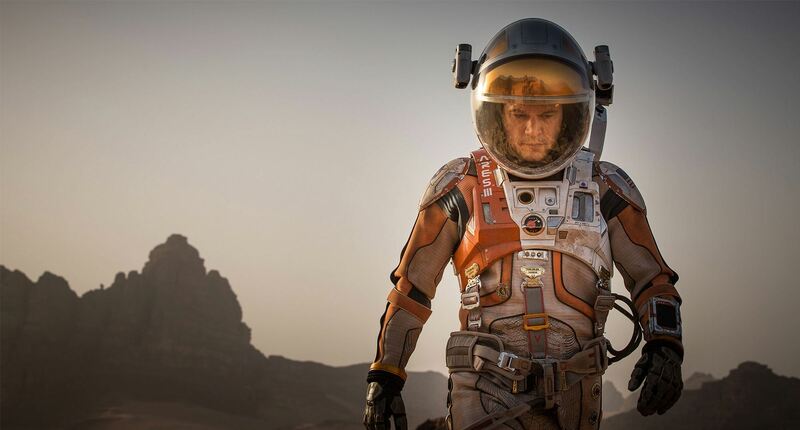 The excitement is building for the worldwide movie premiere of ‘The Martian’ on Oct. 2. Based on the bestselling book by Andy Weir, ‘The Martian’ tells the story of how NASA astronaut Mark Watney, played by Matt Damon, is accidentally stranded on the surface of Mars during a future manned expedition, after a sudden and unexpectedly fierce dust storm forces the rest of the crew to quickly evacuate after they believe he is dead. In the video above, Matt Damon discusses NASA’s ongoing real life efforts focused on turning science fiction dreams into reality and sending astronauts to Mars. Watney actually survived the storm but lost contact with NASA. The film recounts his ingenious years long struggle to survive, figure out how to tell NASA he is alive and send a rescue crew before he starves to death on a planet where nothing grows. Watney’s predicament is a survival lesson to all including NASA. ‘The Martian’ was written by Andy Weir in 2010 and has now been produced as a major Hollywood motion picture starring world famous actor Matt Damon and directed by the world famous director Ridley Scott from 20th Century Fox. NASA’s overriding strategic goal is to send humans on a ‘Journey to Mars’ by the 2030s. “Sending people to Mars and returning them safely is the challenge of a generation,” says Damon in the video. The current six person crew serving aboard the ISS even got a sneak preview of The Martian this past weekend! Gleeful NASA astronaut Scott Kelly, commander of the Expedition 45 crew, just tweeted a photo of the crew watching ‘The Martian’ while soaring some 250 miles (400 kilometers) above Earth. “Watched @MartianMovie on @Space_Station last night! Today working towards our #JourneyToMars during my #YearInSpace!” tweeted NASA astronaut Scott Kelly. Kelly comprises one half of the first ever ‘1 Year ISS Crew’ along with Russian cosmonaut Mikhail Kornienko, aimed at determining the long term physical and psychological effects on the human body of people living and working in the weightlessness of space. The 1 Year ISS mission is an important data gathering milestone on the human road to Mars since the round trip time to the Red Planet and back will take approximately 3 years or more. In order to send astronauts to the Red Planet, NASA is now developing the mammoth Space Launch System (SLS) heavy lift booster and the Orion crew capsule to propel astronauts farther than ever before on the Journey to Mars. The first unmanned test flight of SLS/Orion is slated for Nov. 2018. The first manned flight could occur between 2021 and 2023 – read my new report here. “The Journey to Mars will forever change our history books … and expand our human presence deeper into the solar system,” says Damon. THE MARTIAN features a star studded cast that includes Matt Damon, Jessica Chastain, Kristen Wiig, Kate Mara, Michael Pena, Jeff Daniels, Chiwetel Ejiofor, and Donald Glover. “NASA has endorsed “The Martian’” Jim Green, NASA’s Director of Planetary Sciences, told Universe Today. Green served as technical consultant on the film. I have read the book (I’m a professional chemist) and highly recommend it to everyone. The Martian is all about how Watney uses his botany and chemistry skills to “Science the Sh.. out of it” to grow food and survive. Learning how to live of the land will be a key hurdle towards enabling long term space voyages. Kelly and his ISS cremates took a big first step towards putting that theory into practice when they recently grew, harvested and ate the first space grown NASA lettuce on the ISS using the Veggie experimental rack – detailed in my recent story here. Like a lot. Then there’s the fact that working the land sciencing the sh*t out of it will definitely start the process of terraforming. Bugs will escape. Dead or alive Watney will start it even if it wasn’t going to happen as planned. Previous PostPrevious What Was the WOW Signal?